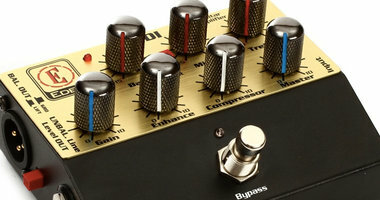 The Boss LMB-3 has 4 knobs, and for the most part it leans towards a classic compressor control set. While some compressor pedals prefer ‘input’ or ‘sustain’ knobs that sets the threshold and/ratio parameters, if you grew up with old school rack unit compressor, you will feel right at home with this pedal. As explained in this Guide to Compression, the two key parameters for compression are traditionally referred to as THRESHOLD and RATIO. The ratio parameter could be thought of as the density of the ceiling compressing your signal. If the ratio is low, the density is low and a good portion of the peaks are allowed to come through the ceiling. If the the ratio increases, so does the density, and if there is an infinity:1 ratio setting, it effectively becomes a concrete ceiling, not letting any peaks through at all. Or a limiter in other words. That is what the RATIO knob on this pedal controls. To stick with this analogy, the THRESHOLD could be thought of as the height of that ceiling. This means that the lower you set the THSH knob, the more compression you will get as a larger part of your signal will enter the ceiling area. However, the RATIO is working in the opposite direction, increasing the density of the ceiling as you turn it up. In short, if you turn the RATIO all the way up,and the THSHD all the way down, you have the absolute extreme dynamics setting this pedal can offer – a brick wall limiter with a very low ‘ceiling’. The ENHANCE knob is essentially a tone control that can add some treble back to the signal in case you feel there is a need for this. 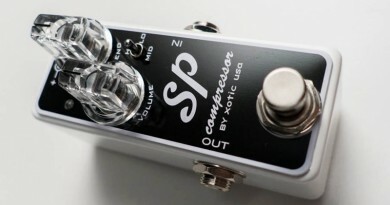 More and more comp pedals come with a similar feature, as one of the consequences of dynamic compression may be a slight loss of high-end frequencies. Finally, the VOLUME knob is equivalent to the MAKR UP GAIN you would often find on rack unit compressors. Another natural consequence of compression is a decrease in the overall output level, and the VOLUME knob allows you to dial in unity gain, or a slight boost if that’s what you’re after. The approach in this review is methodic and the sound clips are divided into 6 rounds. I made RATIO the key parameter for the first 4 rounds, setting it at a fixed value (25%, 50%, 75% and 100%) in the first 4 rounds. Then ‘lowering the ceiling’ gradually with the THSHD knob step by step. The 5th round is exploring the ENHANCE knob and finally, I added a few ‘favorite’ settings in the final round. I use only one sound clip in a re-fx setup. But it holds 4 different playing styles – muted, fingerstyle, slap and pick (first part muted, then legato) – and covers a lot of ground in terms of dynamics. Also there is quite a bit of string/fret noise and even a bit of hum form the bass (it’s NOT the pedal!). Try to listen for the changes on all of these parameters, as you go through the sound clips. Overall, you can make some really nice and deliberately squeezed tones with the LMB-3, but you can also use it as a subtle, always-on pedal that just cleans up the signal a bit and keeps them dynamics under control. So I guess that does make it quite a versatile pedal. Further, you could set the RATIO to 0% and just use the ENHANCE knob to breathe a bit of treble into your sound – maybe in combination with the VOLUME for a slight boost. Could be used as an emergency stomp if you feel you’re drowning in the mix. Just a slight lift in treble and a small boost of the overall volume will make a significant difference. The build quality and physical design is classic Boss stompbox. 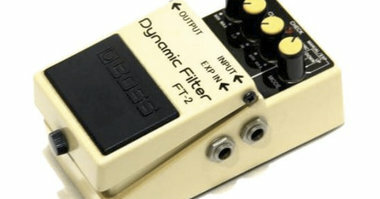 It is solid and – based on experience with other pedals of similar hardware design – probably reliable for many years. The biggest risk is probably that the screw that opens the hood to the battery compartment breaks at some point, but that is of course most likely if you actually power the pedal from batteries rather than an external power supply (which I always prefer). The usability is just fine. For someone with a bit of pre-knowledge from the old-school compressor design the ‘slightly backwards’ function of the THSHD knob is no surprise, and if you find that illogical, it’s just a matter of getting used to it. I personally find nothing wrong with how the knobs act and interact. I didn’t really miss it, but just now and then I would have wished for control over the attack. Release times seemed nice and musical for the most part, but at certain settings, the initial attack of the tone got ducked so hard that I lost sense of the tone. Similarly, visual feedback would have been good to have, but it is not a deal breaker by any means. If I should comment on the physical design, I have always been torn when it comes to Boss pedals. They are true classics, and I love them for that, but then again the design is not exactly compelling compared to modern pedals. Oh, and the color scheme… No further comments. But purely a matter of taste and it definitely doesn’t affect how the pedal sounds, which is of course all that truly matters. 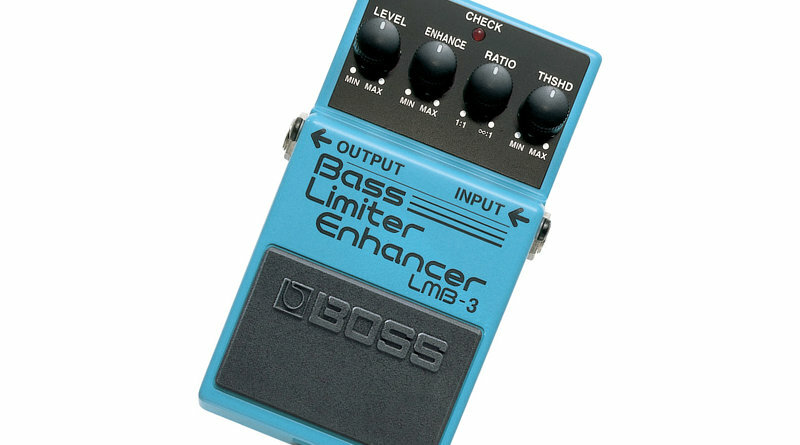 Today (2016), an LMB-3 Bass Limiter / Enhancer is available in most online stores for $79, which is something of a bargain for a pedal of this caliber. I even saw a new one on offer at $60 on Reverb, but the general street price has settled at $79. At this point, I would be hard pressed to recommend another compressor in this price range. If you want to spend an extra $20, TC’s SpectraComp adds more flexibility, but only if you are also up for connecting via USB to the editor. 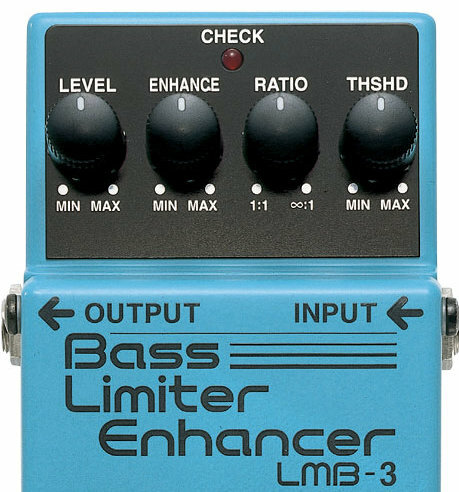 The LMB-3 Bass Limiter Enhancer is a great-sounding and versatile pedal that comes at a price that is very hard to beat. It does the subtle tone-cleaning job well, and can also create some pretty cool squashed tones for you slappers out there. It may not be a beauty, but who cares once the music plays?